Again you have brought me to tears! How blessed Rebekah Sunday is! 🙂 And how blessed you are to have these special moments, then secure them for all time with this post. We love you so dearly. Sharing this with my daughter (mom of 2), and looking longingly over my shoulder at those times when her hand was so tiny in mine. How I would love to do those times again–do them better, do them more as you did. I love you dearly, Mrs. Gore. Love this! Great writing! I love reading what you write! Just beautiful… what an important reminder to take advantage of these precious moments. Sometimes I am too apt to dismiss a late-night waker with “Go back to bed,” rather than taking it as a God-given moment of special one-on-one time with a precious child. Thank you for the reminder. Wow, Mrs. Gore, that is one beautiful, awesome story! I’ve been working on the thankless task of purging emails, and there yours was waiting to give me hope at the end of the day! Thank you for sharing. Praise God for parents like you and children like Rebekah. 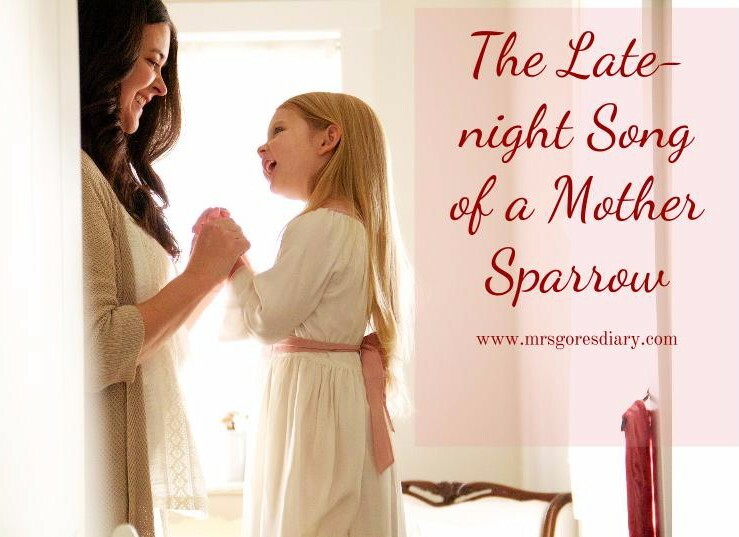 I missed out on girls, but I have several granddaughters and as opportunities present themselves, I pray I’ll be able to share God’s love with them in meaningful conversations as you did with wisdom and sensitivity to the Spirit’s leading.